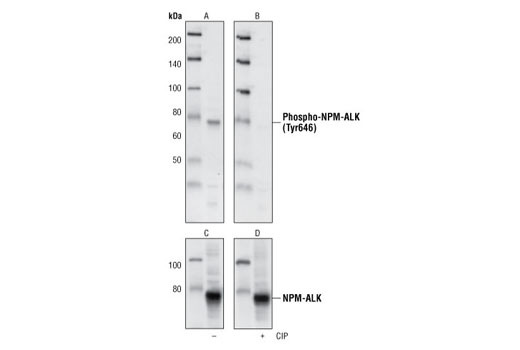 Phospho-ALK (Tyr1586) (3B4) Rabbit mAb detects ALK only when phosphorylated at Tyr1586 (equivalent to Tyr646 of NPM-ALK). This antibody may cross-react with other activated protein tyrosine kinases including EGFR. Monoclonal antibody is produced by immunizing animals with a synthetic phosphopeptide corresponding to residues surrounding Tyr1586 of human ALK.